The world’s most dangerous times created the world’s most dangerous group. In 1986, five angry men channeled all their aspirations and frustrations — about their everyday lives, living in Compton, California — and formed the hip-hop troupe N.W.A. (feel free to Google the meaning of that acronym). Three of these men would go on to become iconic giants in the industry, Ice Cube, Dr. Dre and Eazy-E, the other two, DJ Yella and MC Ren, would remain respected in the genre, but never quite ride that wave of success they experienced whilst working in the music collective. 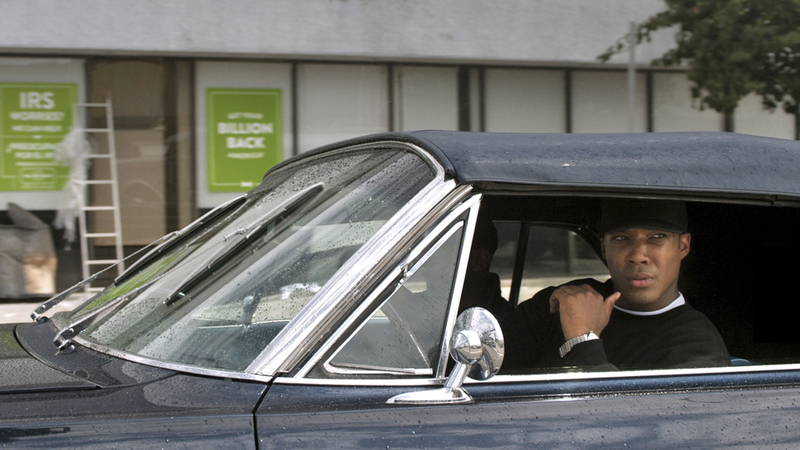 For Dr. Dre (Corey Hawkins), working as a DJ was his best chance at getting out of the hood, for Ice Cube (O’Shea Jackson Jr.), the rap troupe provided an outlet to vent his rage with weighty combative lyrics that triggered both moral outrage and heavy thought, while for Eazy-E (Jason Mitchell), N.W.A. was his ticket out of the drug dealing game, which was fret with violence and fatigue. Throughout this era, tense rivalries would grow within the group, across competing music labels, all the while the social climate of the time — one where the law seemed to indulge in blatant acts of racism — would continually challenge the gang as individuals and as artists. 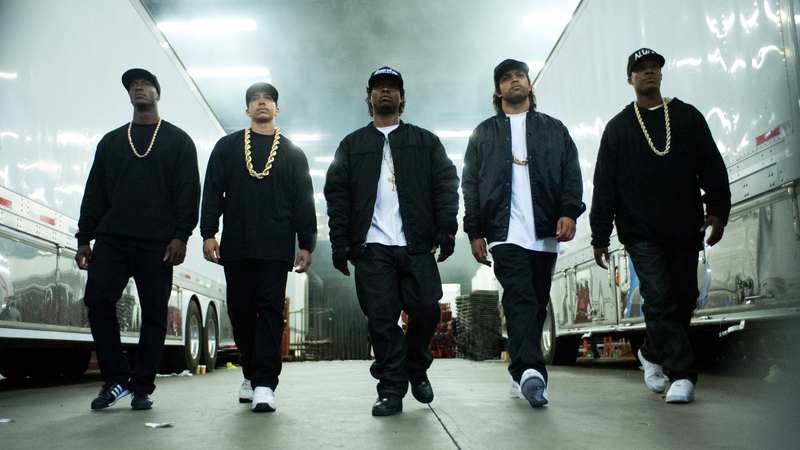 Let’s just get it out there — Straight Outta Compton is straight up dope! It has all the swagger, attitude and authenticity I had hoped for, as well as a surprising amount of emotional heft realized through its excellent cast. Does one need to appreciate hip-hop or N.W.A. to enjoy the flick? If you’re okay with urban obscenities and such, then I’d say no — the film is so slickly paced that, even at a lengthy two-and-a-half hour run time, viewers will easily find themselves drawn into the narrative, regardless. Using brutally honest rhymes and hard-core beats, these rappers had a cause — employing their lyrics as a weapon — as well as a dream, and Straight Outta Compton captures much of the conflict and turmoil — both on the streets and within the group — that led to such an influential period of gangsta rap, from 1987 to 1996, touching on rivalries between record labels, the well-publicized East Coast/West Coast divide and how it bled back onto the streets from whence they came. As it turns out, the film’s director F. Gary Gray, Friday (1995) has had a long-running friendship with Ice Cube, encouraging him to pen the aforementioned urban comedy back in the early 90s, which went onto become a massive hit, cementing Ice Cube’s diversity as an actor. The pair’s intimate knowledge of the period’s trends and surroundings, combined with that of all the other surviving members of N.W.A. (who also consulted on the project), has really come to pay off here, as the picture feels honest and truthful, revealing both the highs and lows of the era, warts and all. To compare, the 2009 movie Notorious — which centered around The Notorious B.I.G. and the East Coast side of hip-hop — while good, was perhaps a bit too glossy, too concerned with maintaining a glamorous image of gangsta life, that at times, came across feeling a little soap opera-ish. This isn’t to say that the characters in Straight Outta Compton don’t indulge in booze, babes and other antagonistic behavior; it’s just not the focus. In fact, Straight Outta Compton’s greatest strength is how it maintains a relatable rapport with its main players that, even when they reach megastar status, viewers will feel as though they’re amongst old friends, with all their suburban history in tow. The casting here is just spot on. Ice Cube’s own son, newcomer O’Shea Jackson Jr., in addition to being the splitting image of his father, plays Cube to perfection, exhibiting all the trademark smirks and grunts that his father is renowned for. Paul Giamatti, Rock of Ages (2012), is a welcome presence as always, portraying N.W.A’s. manager Jerry Heller, a producer who senses a prime business opportunity within the group. Jason Mitchell, Contraband (2012), has a lot of heavy lifting to do as the streetwise Eazy-E, and emerges as the spine of the entire picture — he manages to do this with aplomb. Furthermore, the flick sports a couple of well-realized, but brief character cameos — seeing the initial recording sessions of Dr. Dre’s smoke-filled studio with the likes of Snoop Dogg (Keith Stanfield) and 2Pac (Marcc Rose) is likely to bring a smile to rap fans’ faces. For the multitude of N.W.A. and hip-hop fanatics around the globe, Straight Outta Compton is a must. As for everyone else, if you’re willing to get into urban dramas and such, then you’re likely to find yourself bobbing your head to ‘F**k Tha Police’ much sooner than you think. I’m glad you enjoyed it Mr Movie! Agreed. Even though the film lost its pace and sense of drive after the halfway point, it is still a very enjoyable movie.